North of the museum along Wilsonova, next to the Parliament building, is the massive building of the Prague State Opera (Státní opera). 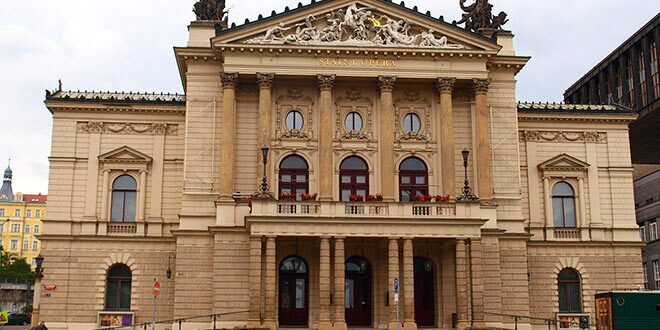 The State Opera was first opened in 1888 as the Neues Deutches Theatre (as a Prague German stage with the performance of Wagner’s opera, The Mastersingers of Nürnberg). Shortly after this time we build our own national theatre. Bohemian-born composer Gustav Mahlar brought the traffic to a standstill, conducting the premiere of his Seventh Symphony. It is one of three important venues for opera in Prague, the others being the National Theatre and the Estates Theatre. Most State Opera performances are from the Italian repertoire – those of Donizetti, Rossini, Verdi and Puccini – with the occasional inclusion of Russian, German and French oeuvres in each season. At festive times, particularly in the lead up to Christmas, the Prague State Opera departs from opera and ballet to become the grand setting for a series of wonderful classical music concerts. The venue is extremely popular and advance booking is advisable and often essential. Among the exceptional artistic figures who performed here were directors Gustav Mahler, Richard Strauss, Felix Mottl, Arthur Nikisch and Felix Weingartner, as well as soloists Anna Bahr-Mildenburg, Berta Lauterer-Foerster, Maria Jeritza, Nellie Melba, Karl Burian, Enrico Caruso, Benjamino Gigli, Jan Kiepura, Richard Kubla, and Tino Pattiera. Ticket prices: range from 100 CZK to 1150 CZK or for a ballet from 100 CZK to 500 CZK.